There are a lot of advanced quoting solutions out there, and each promises you it’s the perfect fit for your company. Before you commit, however, take some time to determine what the right platform is for you and your organization. Quoting is an integral part of the sales process (not to mention one of the most important ways you’ll connect with a customer) and finding the right sales platform should be a key consideration. Will this track my leads and opportunities? Does this fit seamlessly with the platforms I use every day (your CRM, for example)? Is it easy to replicate my approval processes? How rich is the reporting and dashboard capabilities? 2. Embrace change and say goodbye to all those spreadsheets. Change is difficult. It’s easier to stick with what you know, even if it hasn’t been keeping up with your growing business. While current system probably is “good enough” and does allow you to get by, it’s likely holding you back as well. The spreadsheet that was created years ago may have everything you need, but can it easily handle complexity and calculations? You likely have a lot of sweat equity poured into it as well, but moving to the cloud will allow you to become more collaborative, more insightful, more scalable, more accurate, and give you a platform that allows you to keep pace with the mobile trends of the industry. 3. Prepare your product and pricing data. Before you make the move to the cloud, look around your organization and determine where your products and pricing are currently stored. Is your data on paper, in one system, many systems, just in someone’s head, or all of the above? Once you determine where it currently lives, take some time to map out the best strategy to consolidate it, clean it, and ready it for its big move. You should also consider where your accounts and contacts live, as those should live alongside your quoting process on your new platform. A system is only as good as the data within it, so do take the time to prepare your data before you transition. 4. Document your business rules. More often than not, people move to cloud-based advanced quoting systems looking for them to automate complex quote configurations, but a system still needs you to tell it what to do. In order to effectively set up a “configurator” in an advanced quoting system, it is worth sitting down and taking the time to document your current business rules that drive configuration and pricing. List out the questions you ask in your current process, include any dependencies between the questions, note how the answer to one question may influence the available answers to others, and document how the pricing is ultimately calculated. With this documented, you’ll easily be able to replicate your rules in a centralized cloud system. 5. Plan for a phased approach. Moving to the cloud can be a daunting task, especially if none of your other applications are there yet and you have primarily been a paper and pen type of organization. Don’t be overwhelmed; you do not have to make the jump all at once. Specific to quoting, move your simple products to the quoting platform first. The system will allow you to crank out the “simple” quotes quickly and give you an immediate return on investment while you get comfortable with the new tool. As a next phase, start to identify your more complex quotes—those that have defined business logic that would benefit from automation. 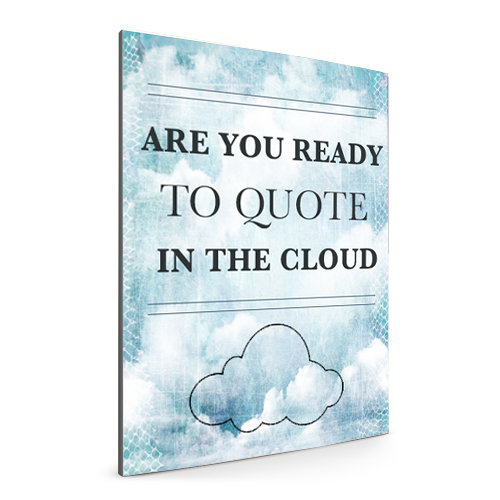 Once you begin quoting those, think about moving the last, most complex quotes, up to the cloud. You don’t have to move all at once, take your time and eat that elephant one bite at a time.